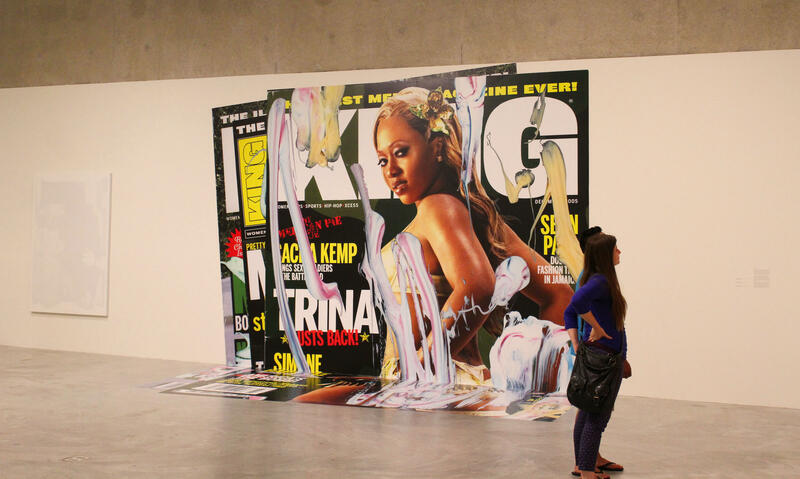 One of Kelley Walker's pieces is a floor-to-ceiling print of the model and rapper Trina scantily clad on the cover of KING magazine, coated in digital scans of smeared toothpaste. 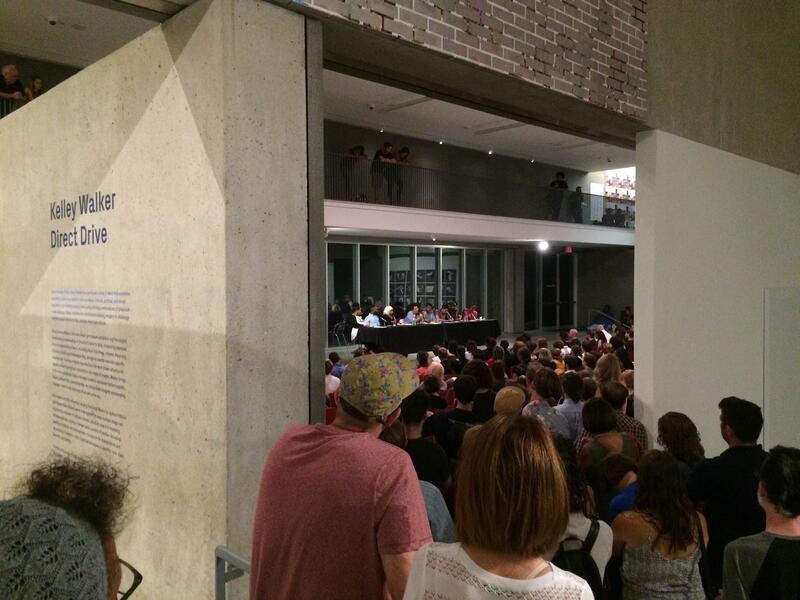 The three employees made their letter public before the museum and Critical Mass for the Visual Arts co-hosted “Critical Conversations: Art and the Black Body.” The panel composed of local artists and academics focused on Walker’s work and how representations of the black body are used in modern art and culture. Many who spoke called out Walker's work for denigrating black celebrities like Little Richard, Michael Jackson, and Kelis. One exhibit includes a floor-to-ceiling print of model and rapper Trina scantily clad on the cover of KING magazine coated in digital scans of smeared toothpaste. "The fact that this rates as being OK for curation is more than problematic. It is disheartening," photographer Kat Reynolds said. "That’s the issue — a lack of awareness and appreciation for black bodies." A discussion on a controversial exhibit at the Contemporary Art Museum by artist Kelley Walker that uses images of black bodies led to a packed house at the museum on Thursday. Thursday night's discussion capped a week in which artists said they felt challenged to respond to Walker's work. Some said that the offensive pieces should be removed. Others warned against censorship. There was a general agreement that the Contemporary Art Museum is an important space in St. Louis serving artists and residents, including children. But artists on the panel said the museum mistakenly allowed Walker's work in the space and then downplayed concerns about his use of black bodies. "If you support this work, you support white supremacy and a white man being able to do whatever he wants without question." Many voiced their disappointment with how Walker responded to questions at his artist talk over the exhibit's opening weekend on Sept. 17. In their letter, Nichols, Barrois and Donaldson wrote that they want the museum to apologize to anyone to who attended the talk and was offended by the artist’s failure to answer community concerns. “Such works have been expressed by staff and community members as untimely and insensitive in the context of the St. Louis community and the current nature of race relations within the United States,” the three employees wrote. All three had considered resigning over the exhibit and the museum’s inattention to artist and community critiques. But in light of the museum’s value they said they preferred to press the museum to make changes. Through Paula Cooper Gallery in New York, Walker released a statement apologizing for his demeanor and responses at the artist talk. "I am a staunch advocate of social equality and civil rights in America. I am also an artist who seeks to create thoughtful, sometimes difficult dialogues about these issues," Walker wrote. "I have always hoped that these works, and the exhibition as a whole, would provide a forum for a conversation about the way American society gets represented in the media as images shift from context to context (newspapers, magazines, film, TV, etc.) and about how the representation of the body, particularly of the black body, is an exceedingly complex topic in American art and culture. I hope that the St. Louis community will give my exhibition a chance to generate this conversation." The artists on the panel said more people need to know how the kind of presentation Walker employs can be harmful. "I am sad; I am hurt," Reynolds said. "But I also am not here to tell you about my black sadness, about my black hurt right now. It’s about you being aware that this is an issue."